* You want to estimate the Bs from E(Y)=XB but you can only observe W=W_min=Y if YW_man and W=Y else. * This kind of data censorship is very common. Many things are only observable in that they are never less than zero or greater than some value. * For example, if you are trying to estimate the number of children a man is likely to have, there is no defined upper limit but there is clearly a well defined lower limit. label var Y "The true underlying amount of children some men would have"
* We can see that all of the coefficients are biased towards zero. * This makes sense in that it if you restrict the range of the ys. * Then the magnitudes of the coefficients is also appropriately restricted. * However, we want to know what the uncensored effect of income is on the number of children is. * Given the structure of the data we might restrict our sample say only to couples who both come from a family of 3 or more children. * The estimate is still pretty bad looking. * The estimate is looking better. * The estimate actually looks pretty good. This does not necccessarily mean that the estimator is unbiased. * Just that this draw of the estimator. * We can see that the estimates look pretty close to unbiased. * However, the noisiness of the estimates is so large due to the restricted sample size that it would be nearly impossible for any single point estimate draw to be large enough to reject the null. * The more concerning thing with a restriction such as this is that it is not clear any more what is being measured. * Ie. 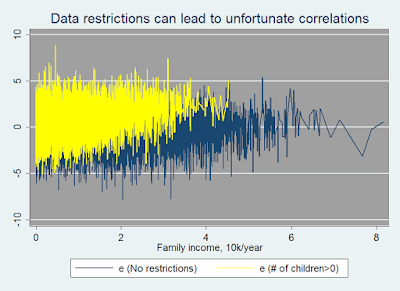 what is the effect of income on children in a family where both parents come from families of 4 sibblings or more and where the income is less than 10,000 a year? * Are these samples really comparable? * This is really creating a sort of selection bias. It does not help out the estimates. * Because we are simulating data we can actually observe u (because we know Y). * We can see that all of the explanatory variables are strong predictors of the censorship error. * does not mean that the restricted regression (if Nchildren>0) is not unbiased. * Under this estimate the bias is from a different source. This we can observe as well. * However, what happens when we restrict the sample? * Strange? No, not really. * Just as the data is censored as a result of the choices of the X variables resulting in a sensorship error, so too if the data is restricted as a function of the explanatory variables then the unobserved error will restricted in a systematic fashion that is a function of the explanatory variables. label var e "e (No restrictions)"
label var e2 "e (# of children>0)"
* error e will push the Y value below W_min. * We can see that making the number of children whole numbers does not bias the results. * However, it does cause the estimators to be less precise (larger standard deviations). * Since corr(rounding_error,X)=0, the only price of rounding the dependent variable is a larger error resulting in less precise estimators. * Note, a poisson regression would typically be thought of as an appropriate regression given the count nature of the rounded data. * This however, would not be appropriate given the underyling data generating process.